Dentinal hypersensitivity (DH) or tooth sensitivity can be defined as a sharp stabbing pain arising from the exposed dentin layer of the tooth. Many journals also refer to tooth sensitivity as the ‘common cold of dentistry’ and ‘toothbrush disease’. The pain is usually triggered by external stimuli that can be chemical, thermal, osmotic, tactile or evaporate. – Over 75% dentists feel that the occurrence of gingival recession, enamel erosion, and DH in patients has increased and this poses a risk to long-term oral health and quality-of-life. – About a third of dentists reported that 30% of their patients suffered from DH. Under normal circumstances, the tubule is covered by periodontal tissues or enamel. 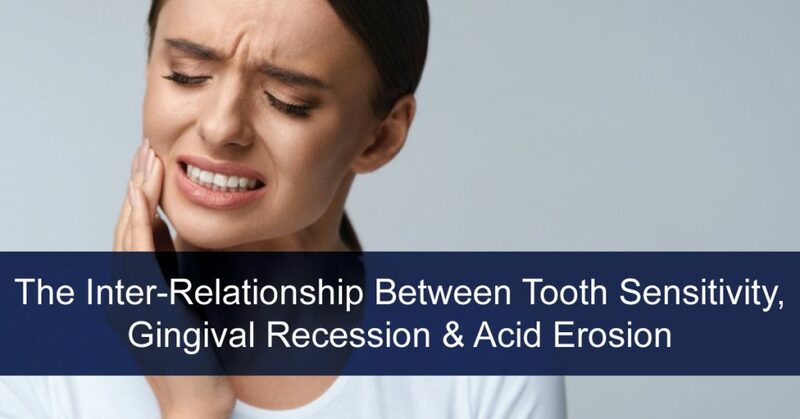 For exposure to occur, there must be a loss of gum tissue (due to recession) or enamel (due to trauma or wear). 88% of adults over the age of 65 and 50% of those aged between 18-64 suffer from gingival recession at one or more sites. Unfortunately, the gingival recession mechanism is still not well-understood. However, some of the main reasons for its occurrence can be attributed to overzealous or neglected oral hygiene and inflammation due to excessive plaque. Since gum recession exposes the root surfaces of the teeth, it leads to dentin hypersensitivity. Today’s diet consists of many foods that are acidic in nature and hence, the consumption of acidic foods and beverages – cold drinks, in particular – has increased tremendously. As a result, there is an increase in mouth acidity, which is responsible for an increase in enamel erosion. Moreover, a pH of 5.5 or lower also results in temporary softening of the enamel. While re-hardening occurs after some hours, enamel is vulnerable to abrasive forces in the softened state. Upon loss of enamel, chemical attacks from the acids can lead to an irreplaceable loss of minerals and weakened the dentin. In fact, at a pH level lower than 6.5, the dentin begins demineralized and the remineralization occurs at a low rate. Many times, dental procedures can lead to symptoms similar to the ones of DH. This is termed as postoperative dentin hypersensitivity. Presence of this condition is evident as 79% to 98% of periodontal patients have reported experiencing sensitivity post procedures. During these procedures, the tubules are exposed that causes a sensitivity. However, after a few weeks, the dentinal tubules become occluded and the symptoms eventually subside. Similarly, after placement of restoration, polymerization shrinkage can follow, leading to brief sensitivity symptoms. In addition, one of the most common procedures that precede temporary sensitivity is bleaching. In fact, 55-77% of patients who underwent tray-based bleaching products experienced sensitivity. Screening and diagnosis of dentin hypersensitivity is the first step towards treating it. For patients who show signs of gingival recession or enamel erosion need extra care. Upon diagnosis, the patient should be counselled on the possible risk factors in order to keep the damage under control. A desensitizing toothpaste can be prescribed for pain relief. After 2-3 weeks, the patient must be followed up with to check if the symptoms have relieved, remained the same, or worsened. If the pain associated with sensitivity has increased or not improved, the dentist should review the differential diagnosis. If dentinal hypersensitivity is still confirmed, then the oral hygiene practices must be reviewed. As a dentist, one must ensure that the desensitizing toothpaste is being used as per instructions. Sometimes, patients continue using their regular toothpaste or use tartar control or whitening toothpastes that are harsh on the sensitive areas. At times, patients follow the instructions diligently at first but go back to old habits once the symptoms go away. It is vital that the patients continue the use of desensitizing toothpastes even after the initial pain has subsided as it can recur and cause the treatment to relapse. A potassium nitrate desensitizing toothpaste effectively reduces the pain after 2-3 weeks of use and offers maximum relief by 8-12 weeks. The patient must be made aware of the timeline so that they know what to expect and continue the treatment long enough for it to work. RA Thermoseal is a toothpaste that contains potassium nitrate. It provides relief from the first day of use in 95% of patients and by day 14, in 100% of them. Fluoride treatments aim to repair the enamel layer by providing high concentration of fluoride ions. Fluoride varnish is often used for remineralization of tooth enamel and caries prevention. This provides relief from sensitivity for a short duration, but multiple applications are needed for long-term enamel strengthening. As mentioned above, dentinal hypersensitivity is a prevalent issue that dentists face in their practice. Gingival recession and erosive tooth wear are two of the most common factors that cause the symptoms of sensitivity. In all cases, early diagnosis can greatly help the patient recover and go back to his or her daily routine without the need for invasive treatments. Only, in cases where minimally invasive treatments don’t show improvement, more invasive periodontal and restorative treatments should be considered. Strassler HE, Drisko CL, Alexander DC. Dentin hypersensitivity: Its inter-relationship to gingival recession and acid erosion. Compend Contin Educ Dent 2008;29:1-9. Bamise CT, Olusile AO, Oginni AO. An analysis of the etiological and predisposing factors related to dentin hypersensitivity. J Contemp Dent Pract 2008;9:52-9. Dababneh RH, Khouri AT, Addy M. Dentine hypersensitivity – An enigma? A review of terminology, mechanisms, aetiology and management. Br Dent J 1999;187:606-11. Miglani S, Aggarwal V, Ahuja B. Dentin hypersensitivity: Recent trends in management. J Conserv Dent 2010;13:218-24. Yip HK, Smales RJ, Kaidonis JA. Management of tooth tissue loss from erosion. Quintessence Int. 2002;33(7):516-520. Dentin Hypersensitivity—Insights from Dental Professionals. Martin Akel & Associates; December 2007. The Story of Dentin Hypersensitivity: Etiology, Diagnosis and Management. Module One. GlaxoSmithKline; August 2005. Holland GR, Narhi MN, Addy M, et al. Guidelines for the design and conduct of clinical trials on dentine hypersensitivity. J Clin Periodontol. 1997;24:808-813. Bissada NF. Symptomatology and clinical features of hypersensitive teeth. Arch Oral Biol. 1994;39 Suppl:31S-32S.